The sifaka is not endangered, but with the rapid rate of natural habitat loss that Madagascar is experiencing, a lot of species, if not yet extinct, are hanging on. “Lemur” means “ghost” and the sifaka is arguably the most ghost-like lemur. However, their leaping dance, for which they are perhaps best know, is more comedic than horror. 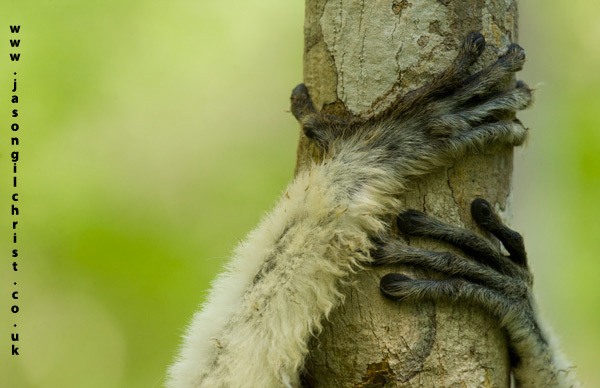 This images shows the good grip of the long fingers of this species. Verreaux's sifaka (Propithecus verreauxi). Primate.